Every writer faces this: the dreaded Writer’s Block. Although it seems simple enough to fix (just write, people say), it can be devastating for any writer. One day of inactivity can ruin months of daily progress. 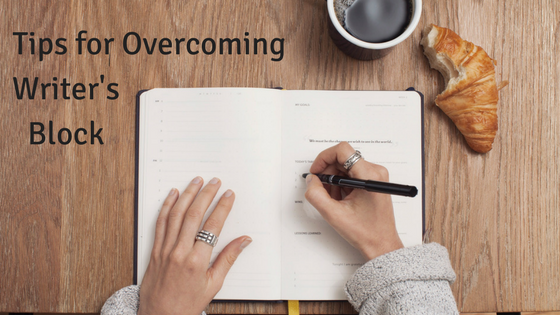 If you find yourself falling into this rut often, here are some suggestions for things you can do to overcome your writer’s block. You don’t have to be a novel writer for this tip to work. Even if you’re a blogger, a poet, or a playwright, you can use outlining to your advantage. If you’re a perpetual outliner, you can try re-outlining your work with some slight changes and see if that sparks some creativity. If you’re a pantser (as in — fly by the seat of your pants-er), outlining can guide you in the right direction. Many pantsers struggle with writer’s block because they don’t know where to go from here. Giving yourself a starting point and an endpoint can allow you to just write, as all the experts say. Turn off your phone, your TV, your computer. Wait, you might say, my writing is on my computer, so why should I turn it off? Don’t worry about your current work, because what you’re about to do may or may not be related. Find a notebook and a pen and begin writing about any topic you want. Eventually, you’ll find some bit that can go into your story. I love writing by hand, because, for reasons I can’t explain, it sparks creativity much more than typing on a computer. Again, you might think this sounds crazy or silly, but it serves a purpose. Imagine you’re talking to someone. It can be anyone, but make sure it’s a person who knows nothing about your story. In the most in-depth way you can, explain your story to them out loud. Eventually, you’ll get to the part you’re struggling in, and you need to make something up. If you want to put the pressure on, imagine it’s someone with importance, and you absolutely cannot leave the story hanging. Throwing an idea out, even if it’s killing all your characters off, can help you decide where your story should go next. November is famously National Novel Writing Month, but this kind of challenge isn’t exactly what I mean. An easy writing challenge can be to journal about yourself before you start writing your story. Another challenge can be to pick a writing prompt and write a scene about it. It can be long or short, but either way, it’ll get the creative juices flowing. There are tons of things you can do to overcome writer’s block, but ultimately, it’ll come down to your preference. If you try a tip and it doesn’t work, don’t give up. Just keep moving forward, try something else, and eventually, you’ll find what works for you. Or you could do what many writers do and take a break from your writing for a few weeks, before coming back to it with fresh eyes.